The economic problem – the corner stone of economic theory – is defined as the satisfaction of unlimited wants and needs in a world with finite/limited physical resources. This implies that not all wants and needs can be satisfied, so the questions economic models attempt to answer are: How is it decided which wants and needs will be satisfied? How is it decided whose wants and needs will be satisfied? In our world today – the answer is: “those who can pay for the satisfaction of their wants and needs will see them satisfied, those who can’t pay for it – well, sorry, we have to draw the line somewhere”. As I was reading about the economic problem for the first time – I found it fascinating that they used the words ‘wants’ and ‘needs’ in the same way and treated them as one term – like this: ‘wants&needs’ – lol. 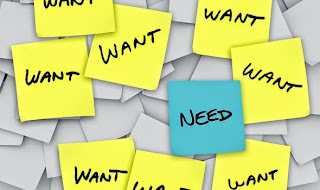 The difference between wants and needs was briefly explained, but then both words were thrown under the ‘wants&needs’ banner – as though ‘needs’ carry the same characteristics as ‘wants’ and ‘wants’ carry the same characteristics as ‘needs’. When you approach the economic problem by reading the words ‘wants’ and ‘needs’ as ‘wants&needs’ - then the world as it is today might make sense to you – then the economic problem might actually be a justification for the desolation and lack in which millions live. Perhaps that is how economists want us to read the words, so that we won’t hold them accountable for not yet having come up with a better solution. ‘Wants’ and ‘needs’, however, are two very different things. ‘Needs’ are things you NEED – that you cannot go without or you will be physically and emotionally compromised. ‘Wants’ are things you WANT – they go beyond what you ‘need’ – you can go without, but you would like or prefer to experience them or have them in your life. It is true to say that if you tally up all the individual wants of all the people on the planet – you will end up with ‘unlimited wants’. The same is not true for needs, however – there are certain things no human being can go without – say food, water, shelter, social interaction, medical support – where this is the same for every single person by virtue of them being ‘a human’ – and where for some, dependent on personal situations and circumstances, the list is expanded to include a few other things as well. Considering that needs are limited – we may actually be able to satisfy the needs of all the human beings on the planet – and it is known that we can. So – instead of trying to work with ‘wants&needs’ where the task seems impossible and full of ‘sorry’s, we have to draw the line somewhere’ – we could start with the part that IS possible – satisfying everyone’s needs – and only then design an additional system or model that draws lines for ‘wants’. Our current model is one where some are able to satisfy all their needs and most of their wants, while others are not supported in their basic needs – which, you have to admit, is quite an insane situation. Part of why this is allowed is due to… ‘wants&needs’. Now – this blog is part of my ‘Meconomics’ series – so you can already guess where I am taking this discussion next… For this situation to be as it is – with so few raising their voice and spurring into action to change the status quo – I started wondering how the same point exists within ourselves. The same point, meaning: do we in fact have a clear understanding of the difference between ‘wants’ and ‘needs’ inside ourselves and do we approach ‘wants’ and ‘needs’ appropriately in our own personal lives? If the dictionary uses the word ‘want’ to clarify the word ‘need’ and uses the word ‘need’ to clarify the word ‘want’ – we can be sure we’re on to something. Does this mean that wants simply imply needs and that needs imply wants – because the dictionary says so? No. Remember, dictionaries will reflect our own language usage – so if the word ‘want’ has been used over time to indicate a ‘need’ – then it becomes an ‘accepted use of the word’ and is reflected in the dictionary as such. In the same way, the word ‘need’ has been used to describe ‘wants’ – and so it has become ‘normal’. 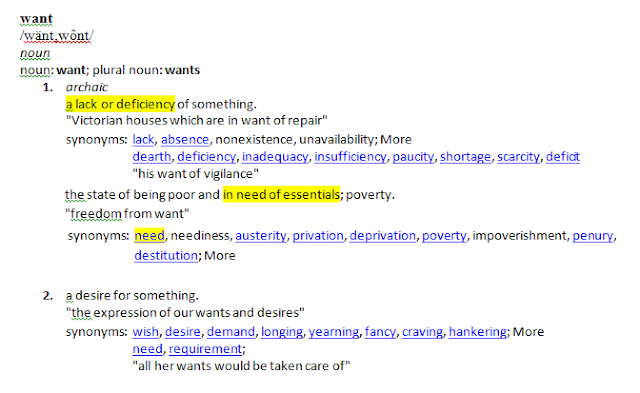 What the dictionary then shows is how we have confused the meanings of the words ‘wants’ and ‘needs’ for ourselves and started using the terms as synonyms. In my next blog I will continue exploring how the ‘merging’ of the words ‘wants’ and ‘needs’ as ‘wants&needs’ affects and influences us on a personal level so that we can get a better understanding of the world as it exists today within the principle 'as above, so below'.